Confession time: I cheated slightly and started reading this one in November, but I technically finished it on December 1st, so it still counts. I just couldn’t wait to officially finish this challenge. This biography was interesting, focusing mainly on the war(s) Obama inherited when he became president. I had already ready two of Obama’s autobiographies (unrelated to this challenge), so I wanted something written by someone else and specifically about his time in the White House. 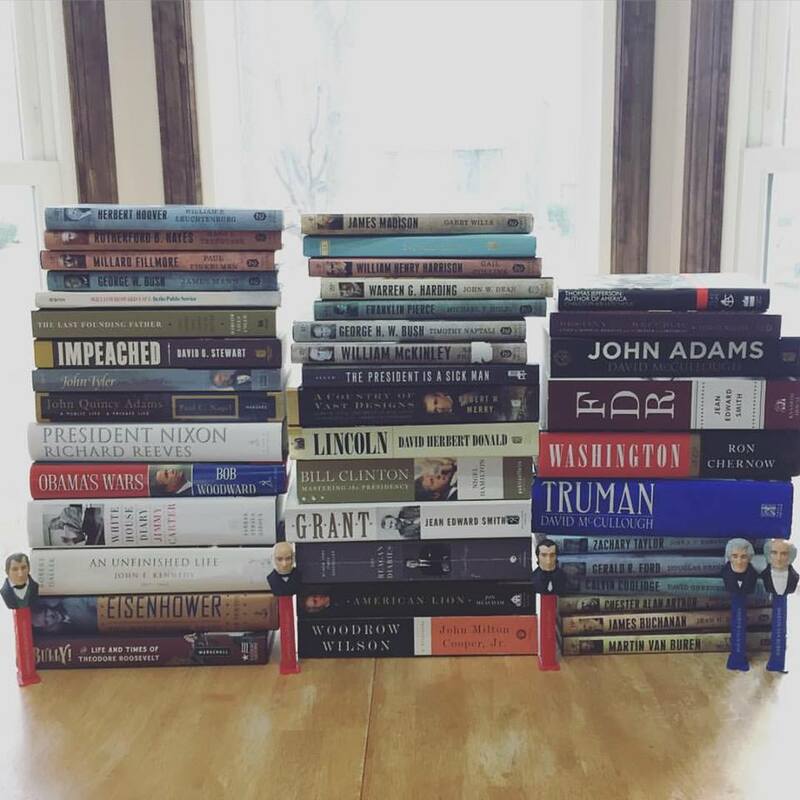 It turns out that there are A LOT of books written about Obama and his presidency, which surprised me since it hasn’t actually ended yet. I picked this biography because Bob Woodward has always interested me as a journalist. It was written pretty well, though there were a few pages when I wanted the loop of “we have to make a decision on what path to take” to be cut by a few hundred words. I did like how Bob Woodward included so much about how the VP was involved with the discussions about what to do. This book was good, but like most books about the Obama presidency, it was quickly outdated not long after it was published due to changing events/times. That said, it was a decent read. And with this, I finished the challenge! I started July 2011 and finished December 2015! I’ve learned a great deal about the country, the presidents, and politics in general. It was well worth the time I put into it! I believe it’s probably pretty hard to summarize most presidencies into a very short book, and even harder to summarize a presidency with as much drama and war as George W Bush’s time in the White House. But, I just could not do another long book. Especially a long book on a very recent president. There isn’t the distance that decades and generations of time passing that gives an author a bigger perspective on the issues and decisions made. That said, this book was very good, especially in covering such a presidency in under two hundred pages. I learned a great deal about the inside of Bush’s WH years and about his life pre-presidency. The writing wasn’t dry or boring. This was probably the first presidency that I experienced as an adult. I remember the Clinton allegations and such, but that was before I was able to vote, before I was in college…but Bush’s era was my era. And so, I felt a deeper interest in reading the inside scoop on his years and opinions in the WH. And someday, in the future, when years and years have passed, I want to read another biography (a long one) to see how time has changed (or not changed) our view (or, at least MY view) of Bush and his presidency. I wasn’t sure what biography to read for Clinton, especially because I had already read his autobiography a number of years ago. Reading it for a second time (even though most of the details have probably fled my mind) seemed almost cheating on the challenge. When I found this one at Half Price Books, I snatched it up and hoped it would be good. Well, it was only so-so. It was dry, very, very dry. And the author used a lot (A LOT) of metaphors in these pages, and after a few hundred pages it became comical to me, which was probably not the author’s intent. I did enjoy the inside view to Clinton’s early days in the White House, and his struggles with his cabinet and staff members. The author seemed pretty heavy handed against Hillary, which made me wonder what he’d think with her running for president for 2016. I would probably search out for a different book for Clinton if I had the chance. This one was long and only somewhat informative. He had very conflicting ideas on many things – religion, slavery, etc. Monticello was mostly a disaster for Jefferson’s entire life because he kept reconstructing it. More about the conflict between him and Adams. I feel like it was glossed over. It DID explain a lot about the conflict between the Federalists and Republicans but I would have liked more on their friendship, personally. More about Jefferson’s time overseas. I felt like I learned a lot more from the Adams biography. I also know from Adams’ biography that Jefferson has a friendship with Abigail Adams which this book barely touched on. I feel like is Jefferson is glamorized in history books/society. This book showed a lot of his faults. I went back and forth between thinking, “This guy isn’t so nice” and “This guy is human, just like the rest of us.” He also was a very forward thinker which often got him in “trouble” because it didn’t agree with the opinions of his time. Perhaps one day I will pick up another book on Jefferson because I feel like there was a lot more to learn. Overall, this book was a good start and relatively easy to read. I will start off by saying John Adams is WAY more interesting than George Washington. Sorry, George. The only reason I chose this book for my presidential challenge was because I already had it on my Kindle and didn’t have to fight library due dates to finish it. I was happy I did. I knew nothing about John & Abigail Adams so I was completely fascinated by every aspect of their relationship. You know darn well that a woman these days would have dropped a husband who lives overseas for 8 years and doesn’t bring her with! It’s amazing that their letters survived, even after each requested that some of them be destroyed, which they weren’t. And though they both were educated, the grammatical and spelling errors in the letters kind of shocked me. I was bothered a bit (okay, a lot) that John put his job before his family. “John justified the guilt he felt for his abandonment of this (parent) role in the same way that he rationalized his absence from Abigail. Public service was a higher duty that he owed society.” Well, John, I’m sorry but I think you were wrong. Your children barely knew you and your wife was left to handle EVERYTHING. What an amazingly strong woman Abigail Adams was. I would not have put up with John’s antics. And I probably would have insisted that I go to France with him. He takes their children and not her? Nuhuh. It was interesting that Washington was almost forced to serve two terms as president when he didn’t want to and yet Adams WANTED the position and struggled to get it. He was NOT happy with the vice president position – he wanted it all! “Clearly, he felt overwhelmed by the protocols of a position he would later refer to as ‘the most insignificant office that ever the Invention of Man contrived of his Imagination conceived.” Bet Mr. Biden doesn’t feel like that these days! Also intriguing was the difference in background between Washington – a military man – and Adams – a law man. Clearly, history class was wasted on me as a kid as I had absolutely no idea that the “format” of our government today – House, Senate, electoral college, etc. – dated back to this time. Wow. Our government has survived over 200 years. I’ve heard that there was a falling out between Adams and Jefferson but I felt this book kind of glossed over it so I’m hoping that whatever book I choose on Jefferson will go into lots more detail. Overall, I really enjoyed the story of John & Abigail. Sometimes the writing was tedious and repetitive though. If you are looking to learn more about John Adams, I would recommend this book! I picked this biography because it was short. After months of LONG reads, I picked on size alone. I wasn’t sure what to expect, since I’m not a huge fan of the Bush Presidential Dynasty. It was an emotional read. At times, I found myself agreeing and/or liking HW…and then he would do something and I was appalled yet again. I feel I have a bigger understanding of his years in the White House now, but my opinion on him remains largely the same. However, I do have a special admiration for how HW, Jimmy Carter, and Clinton have gotten together as Post-Presidents in humanitarian and other endeavors. When I purchased this on clearance or at a book sale, I didn’t realize it would become a second month of diaries in this challenge. I liked Jimmy Carter’s diaries as the biography for last month, but this one was a bit more tedious. Possibly, that’s because RR and I disagree on more aspects of politics than JC. Possibly, it’s because the RR diaries were a bit dryer. And JC had added more recent commentary/notes to his, whereas RR (obviously) wasn’t alive to do so. All that said, there was still a lot of information to glean from the (many, many) pages. I found the notes about his family life and relationships to be fascinating and, at times, odd. His descriptions of Camp David and his ranch were descriptive…they made me want to buy my own ranch. The portions surrounding when he was shot in the attempted assassination made me tense and sad. Politically, I wanted more out of the book. There was some insight into his thoughts and experiences, but not as much as I’d hoped for such a huge book.